We found this little plant on the slopes of Uley Bury this morning on our walk before the forecast rain. As we were unfamiliar with it, we were pleased to identify Yellow Wort from our various books. It is apparently common on chalk or limestone grassland, such as here in the Cotswolds. One of the Gentian family along with other members it's flowers close up in the afternoon which might be the reason that we hadn't noticed it before as we often seem to walk up there later in the day. The leaves are in pairs on the stem and a bluish grey colour. 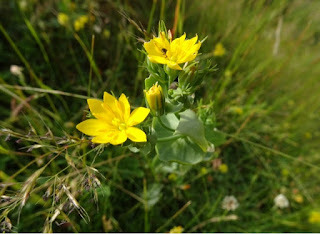 The petals of its yellow flowers vary between six and eight petals joined into a tube at the base.